Cytosorbents Corp (NASDAQ:CTSO) is a company poised for growth and it is easy to see why investors are so excited about CTSO. The stock currently trades at $4.49 and locked in gains of 2.50% today. 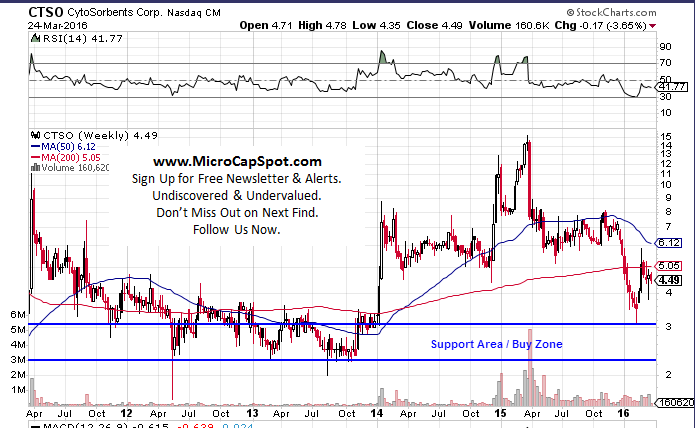 There as an established base around the $2.50 to $3.00 range this should limit downside to the stock. CTSO traded as high as $14.73 in 2015 and 2016 looks to be the year it turns around. CTSO is high margin, high value, repeat order disposables business. It sells a “razorblade” that works with the existing “razor” dialysis and cardiac surgery blood pump infrastructure in hospitals worldwide today. Although CTSO does not need approval in the U.S. to be successful, a major company objective is to obtain U.S. FDA regulatory approval for CytoSorb® for use in cardiac surgery. There are approximately 1,000,000 open heart surgeries (e.g. coronary artery bypass graft surgery, valve replacement, aortic reconstruction, congenital defect repair, heart-lung transplant, and others) each year in the U.S. and European Union. This application was chosen because, with the aging baby boomer population, it represents a $1 billion growing total addressable market and unmet medical need, and has lower regulatory risk than sepsis or other critical illnesses. There have been a slew of recent developments and announcements at Cytosorbents Corp (NASDAQ:CTSO). The company recently announced its fourth quarter and full year 2015 financial results. CTSO posted record quarterly and annual revenues. CytoSorb sales surged to $4 million for 2015 which accelerated in the 2nd half of the year. Total 2015 revenues increased 16% from $4.1 million in 2014 to $4.8 million in 2015. Fourth quarter product sales netted a record $1.5 million which represented a 72% increase from same period in 2014. In the fourth quarter, CTSO tripled direct sales and doubled its direct customers. In 2015, the company administered more than 10,000 human CytoSorb® treatments. It also increased geographic distribution of CytoSorb® to a total of 32 countries, with the addition of Italy, Israel, Australia, New Zealand, and Vietnam. CTSO is hitting an inflection point in markets where it doesn’t need sales calls. CytoSorb® has been on the market for three years in Germany, a market that was developed approximately one year ahead of the rest of most of our other territories. During that period of time, it has gone from zero market recognition to now being considered one of the only viable treatment options for patients in many different diseases and conditions in the intensive care unit (ICU) and cardiac surgery. More than 70% of German university hospitals and most of the major public hospitals are customers. CTSO is a leader in critical care immunotherapy commercializing our CytoSorb blood purification technology to reduce deadly uncontrolled inflammation in hospitalized patients around the world, with the goal of preventing or treating multiple organ failure in life-threatening illnesses. The technology is based upon biocompatible, highly porous polymer sorbent beads that are capable of extracting unwanted substances from blood and other bodily fluids. The technology is protected by 32 issued U.S. patents with multiple applications pending both in the U.S. and internationally. Our intellectual property consist of composition of matter, materials, methods of production, systems incorporating the technology and multiple medical uses with expiration dates ranging from one to 10 years. CTSO is currently trading at a $113 million market valuation. The company is gaining momentum as sales begin to accelerate and it begins hitting an inflection point. An FDA clearance would clear the way to a $1 billion market. The company is firing on all cylinders and has an extremely powerful business model. It will need to eventually drive the revenue growth to its bottom line. We will be updating on CTSO when more details emerge so make sure you are subscribed to Microcapspot so you know what’s going on with CTSO. Disclosure: we hold no position in CTSO either long or short at the publication of this article and we have not been compensated for this article.